Legendary actress Molly Ringwald will kick off Stocker Arts Center’s Performing Artist Series on Oct. 24. The series of dinner theatre events will showcase a variety of singers and musicals. For the premier show, Ringwald (star of Pretty in Pink and The Breakfast Club) will perform a selection of songs from her jazz album, Except Sometimes, as well as a mixture of show tunes. Rather than pre-select the songs in advance she’s going to sing, Molly allows her feelings and the mood of her audience dictate what her choices will be for each performance. Producing an event of this caliber takes a dedicated team to organize and manage all the details. Lorain County Community College President Dr. Roy Church first came up with the idea of the dinner theatre in order to establish an inner-relationship with the Culinary Arts program to other campus events. Janet Herman Barlow, director of the Stocker Arts Center, further advanced the series. “I was reporting to Church for a year when they were transitioning vice presidents for strategic and institutional development,” she said. 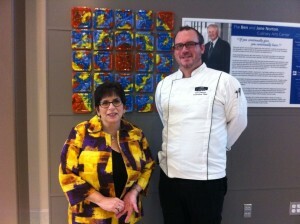 “The goal was to eventually incorporate some of the culinary arts students in the Performing Artists Series to help out. 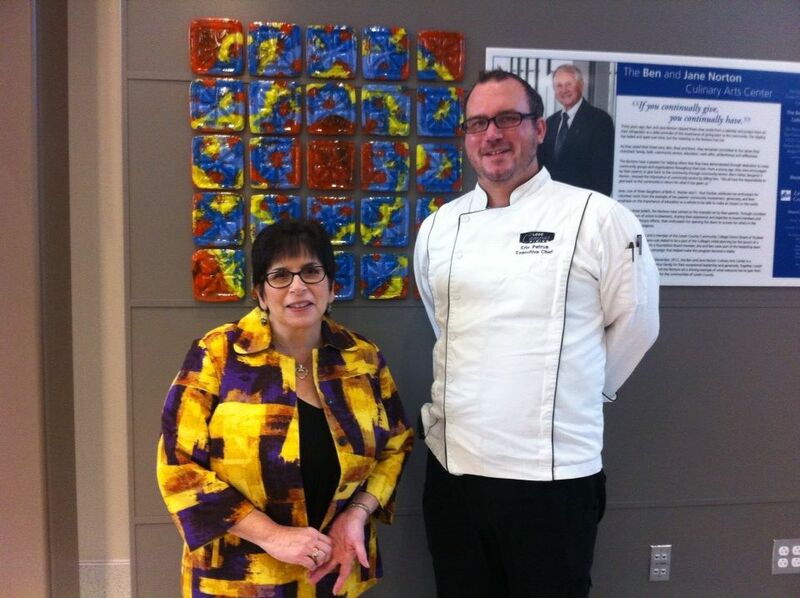 Eric Petrus, executive chef and culinary arts instructor, joined LCCC in Oct. 2009. Petrus’ passion for the culinary arts field began at 16-years of age, and he has been actively pursuing his interest for 18 years. The entire dinner is prepared by the Culinary Arts staff and served in the fairly new Norton Culinary Arts Building on campus. Dinner theatre events will be served restaurant style instead of buffet style. For the series, there are two salad options, three entree options and two dessert options available. The menu’s only change this year is to offer seasonal items, as appropriate, since the shows run throughout the school year. Three separate menus are featured; fall, winter and spring. “We try to feature items that are in season, like butternut squash, so we can order local produce,” said Petrus. Guests are required to order in advance so that purchasing and preparation can be planned for. The actual cooking is done on the day of the performance and after the guests are seated. Serving takes place before the performance. Seating will be dictated by the type of performance, with serving spaced out between 30 to 45 minutes apart. For the fall semester there will only two dinner theatre events will be held. Single tickets run from $26 (mezzanine) to $39 (orchestra), but with a valid student ID any of the Performing Artists Series events are $10. There have been no special celebration requests for previous events, but Barlow and Petrus are flexible and willing to coordinate something special for anniversaries or parties. A highlight for Petrus during these events is being able to interact with the audience members to make sure the food meets their taste and is to their liking. Catering events of 300-400 people in LCCC’s Spitzer Conference Center is a feat Petrus is no stranger to. Tickets for the Series can be ordered through the Stocker box office, while the dinner menu can be found on through LCCC’s website on the “Performing Artists Series” page. Theatre ticket purchasers will be called about ten days out for their dinner menu choices by the Stocker Center. “Out of 50 available tickets for the first dinner with Molly Ringwald, we’ve sold 44 seats to date,” said Barlow. There is no dress code or cancellation policy for these events. Last year the foundation bought a glass of wine for everyone who had a dinner. Beer and wine are typically sold at the concession. However, if someone wants a glass of beer or wine from the culinary area, it would be served to them on a cash bar basis.